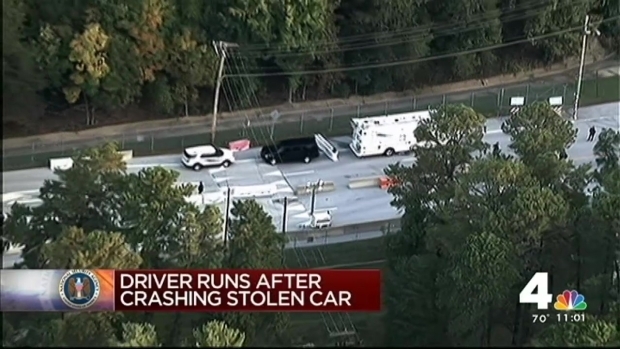 Police captured the man they say crashed a stolen car into a gate at Fort Meade in Maryland and then fled on the campus. The suspect hid overnight in an underground storm drain under a bush in a wooded area after the crash about 9 p.m. Wednesday, Anne Arundel County Police said. Dontae Small, 41, of Hagerstown was caught within minutes of emerging from the storm drain about 10:15 a.m. Thursday, according to Fort Meade. Officers pulled the car over near Arundel Mills Boulevard Wednesday night, but the driver sped off. 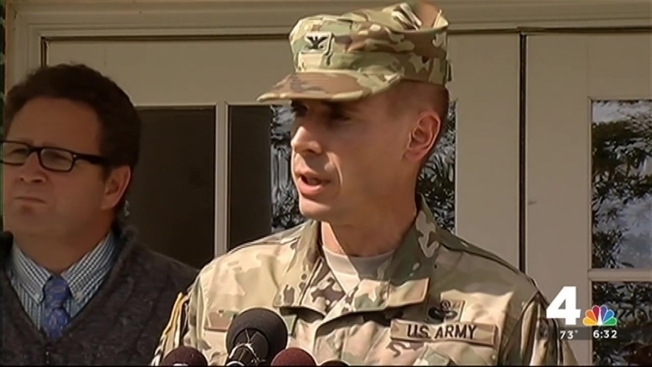 The car entered Fort Meade through an employee-only entrance and crashed at a gate on the interior of the installation, Garrison Commander Col. Brian P. Foley said. Fort Meade will investigate how the suspect managed to get so far onto the installation. Police have captured the man they say crashed a stolen car into a gate at Fort Meade in Maryland and then fled onto the campus. No officers were injured, police spokesman Lt. Glenn Shanahan said. The car crashed at a location where building of a new access control point began in June, Foley said. Fort Meade was placed on reduced operations for most of the morning, and residents were asked to stay indoors while police searched for the suspect. Operations at the installation have returned to normal. The crash was near an area where about 400 service members live, and the suspect was found near one of the buildings where they live. The suspect's car was identified as one that had been stolen in a carjacking in Baltimore Sunday. The victim told police he was walking home from parking his car when three men robbed him of his car keys. One of the men had a gun, Baltimore Police said. Only one man was in the car at Fort Meade incident Thursday. Earlier this year, 27-year-old Ricky Hall, a transgender woman who went by the name Mya, was killed, and a passenger was wounded when police opened fire after the pair tried to gain unauthorized entry at a National Security Agency gate at Fort Meade.